We are peoples of tunnels. We are born in them and never leave. We put up with their darkness and thrive on their dampness and rot. Our schools are tunnels, and so are our universities. Our books and our minds are sealed tunnels. In such tunnels, you find bitter fanatics, hamstrung armies, glum political parties and instruments of disinformation. We had no states. We had tunnels-in-waiting, waiting for an opportune moment to overpower the adjacent tunnel’s dwellers. When an opinion crosses someone’s mind, we lure it into a tunnel. And when spring approaches, we send tunnels to kill it. The news was both interesting and informative. The lady newscaster was eloquent and pleasant. A NASA spacecraft has landed on Mars. Overnight, the Curiosity rover beamed back the first images of the Martian surface. Clearly the United Sates had conquered the Red Planet some 40 years after landing the first humans on the Moon. I closed my eyes in front of the TV screen. I thought it would be great if an Arab TV news channel announced that an Arab leader had sent a message congratulating Arab scientists on a scientific achievement liable to benefit their country and the world at large. I quickly dismissed the thought for fear of hallucinating and went back to the screen. The cute newscaster then moved on – almost apologetically -- to detail another news headline on the daily quota of some 200 killings. I then feared she would move on and conclude by hosting the habitual “analysts” who invariably impair listeners’ intellects and make them lose sleep. I was afraid one of them would show up to deny the Mars landing altogether and say it was simply a simulation produced by the corrupt West. I imagined another “analyst” suggesting the Curiosity rover was the Mossad’s brainchild intended to spy on the Arab countries from Mars. I feared a jihadist faction coming forward to condemn the Americans’ invasion of the Red Planet and invite suicide bombers to take out the science rover. I was also worried about Iran announcing shortly that it has produced a new generation of missiles capable of hitting Great Satan targets on Mars. Going back to planet Earth and the Middle East, the scenes coming out from Aleppo and its sister cities are heartbreaking: corpses on the streets; pools of blood inside bedrooms; and photographs of terrified families fleeing to neighboring countries with their children. The Arab citizen does not grieve over the obliteration of Aleppo, one of the oldest continuously inhabited cities in the world. The Arab citizen bemoans Syria’s unknown future. More alarming than the buildings biting the dust is the sight of Syria’s social fabric melting away and the risk of Syrian society’s components fragmenting. A victory in Aleppo won’t extract the regime from the tunnel, but prolong its stay there. The inflow of roving fighters and the practices of some fanatics risk plunging the Syrian opposition in the tunnel as well. A second news item is no less alarming. It is about the brazen (Sunday) attack on an Egyptian border post in Sinai, south of Rafah. Undoubtedly, the intention of the attackers is to shove Egypt into a horrible tunnel that would undermine Egypt’s status, the dignity of its army and its ability to control its borders and fulfill its commitments. The Sinai outrage reopens the entire file of tunnels (used to smuggle people to and from Gaza, as well as goods, food and fuel from Egypt to the Strip). What is at stake here is much more serious than the fate of the Gaza smuggling tunnels. The third news relates to the Iranians captured (in Damascus) by the Free Syrian Army. Their photograph with their captors proves the Syria crisis has rammed Iranian policy into a tunnel that can only deepen the sectarian divide in the region. Furthermore, Ahmet Davutoglu’s visit to Kirkuk, and the current situation in Syrian Kurdish villages bordering Turkey shows that Ankara’s regional policy has in turn slipped into a tunnel. 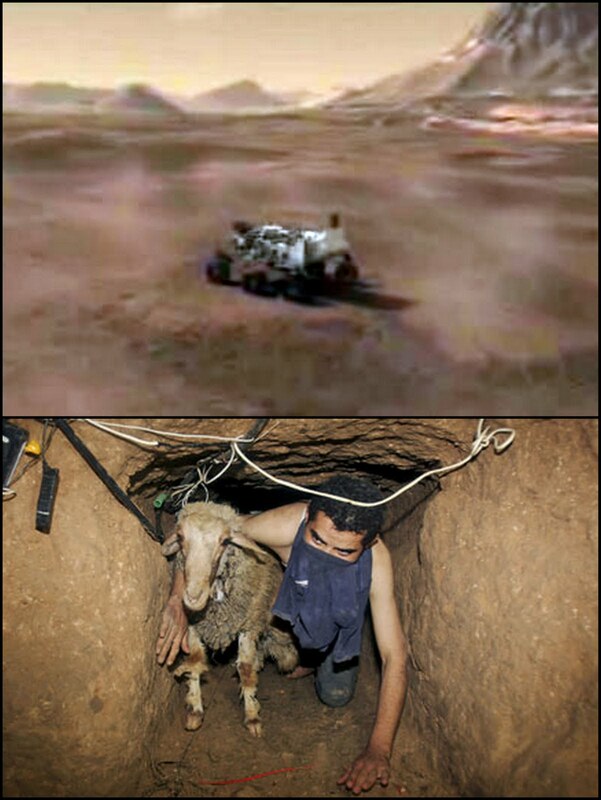 While others send science rovers to Mars, we send our children to graveyards, or to tunnels in anticipation of looming civil wars. A brief news bulletin suffices to expose our disastrous whereabouts in what is known as the Global Village. We are peoples of tunnels. We are born in them and never leave.